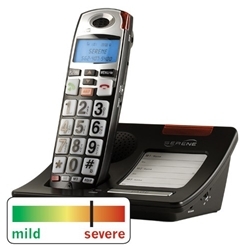 The Serene Innovations CL-60 is a user-friendly cordless telephone with an intuitive design featuring large backlit buttons, talking Caller ID and three one-touch memory buttons. Ideal for people with hearing loss, low vision or limited mobility. Base battery: Optional 4 x AAA size NiMH-rechargeable batteries (provided by user).